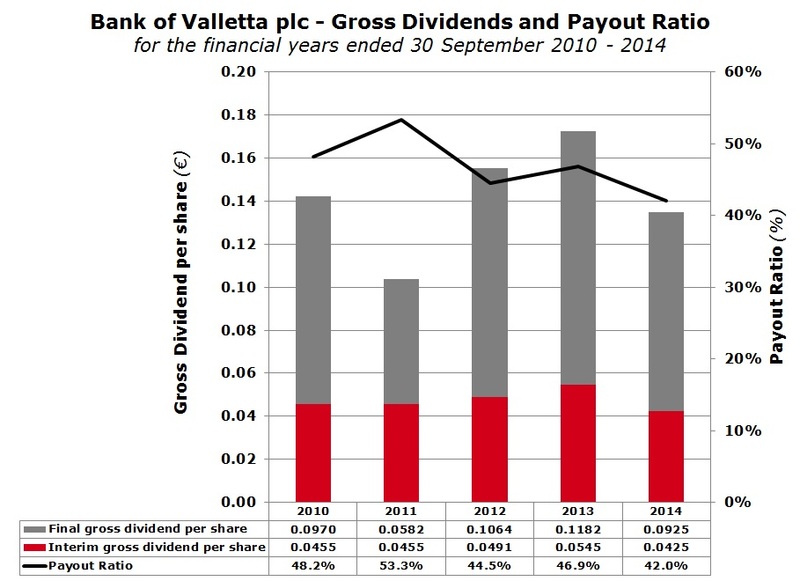 The September 2014 annual financial statements of Bank of Valletta plc were published shortly after the close of last Friday’s trading session. Market participants have now become accustomed to the procedure that the two large banks immediately call a meeting with financial analysts to explain the financial statements in greater detail. This year’s meeting with BOV’s Chairman and top management was also eagerly awaited since it came only a few days after the publication of the results of the Asset Quality Review and the stress tests conducted by the European Central Bank and the European Banking Authority. 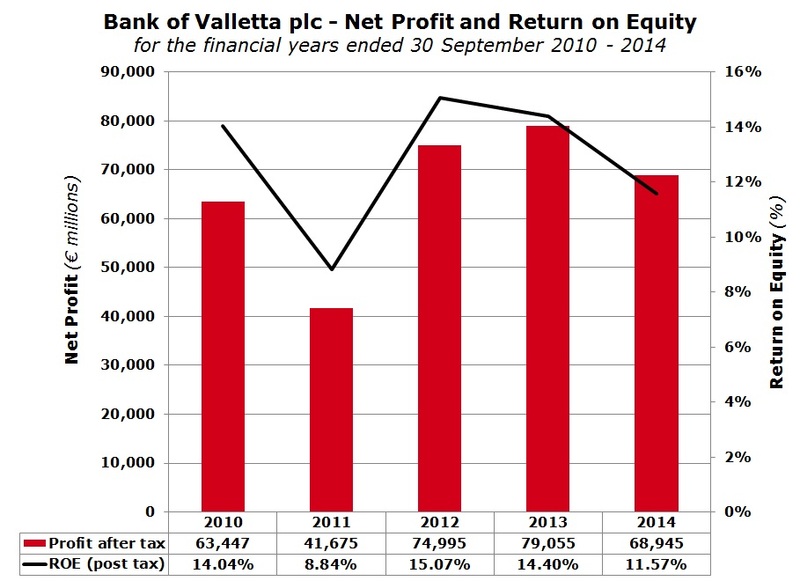 During the 2013/14 financial year, the BOV Group registered a pre-tax profit of €104 million representing a decline of 10% over the previous year. It is true that this is the lowest profit achieved in the past three years but it is probably also true that profits are above market expectations given the challenging environment in which the banks are operating. Core profitability (excluding fair value movements on the bond portfolio and returns from the insurance activities) was actually 2% higher at €87.9 million. This implies that the reason for the profitability decline was the average returns from financial markets compared to the very positive impact during the previous year. As a result of the calmer situation across global financial markets, fair value gains of €9 million during the last financial year are 48% lower than the previous year and likewise, the share of profits from insurance activities dropped by 42% to €5.2 million. The most remarkable figure in the financial statements is the growth in the deposit base. During the past 12 months, BOV attracted a further €900 million in deposits. This represents a 14% increase in the deposit base to €7.1 billion but unfortunately, the loan book only increased by 5% to €4.1 billion during the past financial year. While on the one hand this surge in liquidity may be taken positively, the reduction in the loan to deposit ratio to only 57.9% compared to 70.2% in September 2010 is not a good indicator for the bank’s shareholders. During the meeting it was explained that only 25% of new deposits are being converted into new loans with the additional liquidity available for investment. This is one of the many challenges being faced by the bank given the very low interest rate environment. The dividend recommendation is probably that which interests most shareholders. The final dividend to be approved at the Annual General Meeting on 17 December of €0.0925 per share represents a 22% decline from last year’s final dividend. The total dividend in respect of the 2013/14 financial year of €0.135 per share (which includes the interim dividend of €0.0425 per share distributed last May) translates into a dividend yield of 6% before tax based on the recent share price. The dividend payout ratio dropped to 42% compared to a ratio of around 50% during the past several years. BOV’s Chairman Mr John Cassar White explained that the European Central Bank and the MFSA want banks to retain more capital and distribute lower dividends compared to the past. The Chairman noted that nowadays dividend distributions need to be discussed and approved by the regulator on a periodic basis. As such, the Chairman clarified that although the dividend payout was reduced from 50% to 42% during the latest financial year, this cannot be taken as a new standard policy. This therefore creates more uncertainty for investors since over the past several years, BOV shareholders had become accustomed to a distribution of half of the annual profits in any year. At the start of the presentation, BOV’s Chairman gave a very detailed and clear explanation of the AQR and stress test findings and the subsequent discussion with the ECB on the treatment of the findings. The investing public deserves such transparency and other companies should follow in a similar manner when communicating to the public at large via company announcements and when meeting with financial analysts. Investment decisions should only be taken based on a comprehensive understanding of a company and as such top management of issuers of listed securities (whether equities or bonds) should do their utmost to assist financial analysts accordingly in their obligation to assist the market. The Chairman confirmed that the Asset Quality Review conducted by the ECB found that BOV had under-provided by €10.6 million (after tax) and the non-performing loan ratio increased to 18% following the detailed review process. On the other hand, the review also indicated that the bank had also taken excess provisions in the past especially in the mortgage sector. The extent of the over-provision was €16.4 million. However, Mr Cassar White stated that these two figures cannot be offset against one another. The Chairman also explained that BOV had a lengthy conference call with the ECB before closing off this year’s financial statements on possible adjustments that may be necessary as a result of the AQR findings. Mr Cassar White stated that the ECB did not want BOV to write off the €10.6 million in the financial statements since it was not an accounting exercise as the model used in the AQR was not strictly aligned to accounting rules. Despite this decision, BOV effected a transfer of this shortfall from distributable reserves to undistributable reserves. However, this adjustment did not have any impact on the profitability of the bank. The Chairman also indicated the all banks across the EU are still awaiting guidelines from the ECB on the manner in which such findings should be treated. This figure is also likely to change since it is based on the situation as at 31 December 2013. As such, once the rules are established by the ECB, this will be run through the actual data and any adjustments would then be reflected in the financial statements of the current financial year to 30 September 2015. Moreover, the Chairman clarified that the findings of the AQR in respect of the under or over-provisioning to date and the level of non-performing loans arose from a different methodology used by the bank as opposed to that established by the ECB for this exercise. The ECB will also be coming out with clear guidelines on what constitutes a non-performing exposure and this may require an adjustment on the internal model and as a result a different provisioning policy. Since the stress test indicated that BOV is well-capitalised even in the adverse scenario, BOV does not require additional capital immediately and the annual bonus share issue together with the additional profit retention through lower dividends will be sufficient for the time being. However, this is bound to change in the years ahead due to increased capital requirements under Basle III rules as from 2018. Due to the low interest rate environment which is expected to prevail for several years and increased regulatory pressures to retain higher capital, the return on equity across the banking industry is being negatively impacted. BOV is no exception and the post-tax return on equity dropped to 11.5%. BOV’s Chairman explicitly stated that the banking sector is at the start of a period of change under a new regulatory regime. Investors need to realize that in all probability, the golden years for the banks with very high returns on equity and the liberty to distribute high dividends to shareholders is a thing of the past. The Chairman also comments that “the banking sector will be safer but less profitable” and as a result with lower dividends to shareholders. This may take time for some investors to come to terms with.